Tim Duncan of the San Antonio Spurs after winning the 2014 NBA championship. Tim Duncan of the San Antonio Spurs. WTF, nerds? 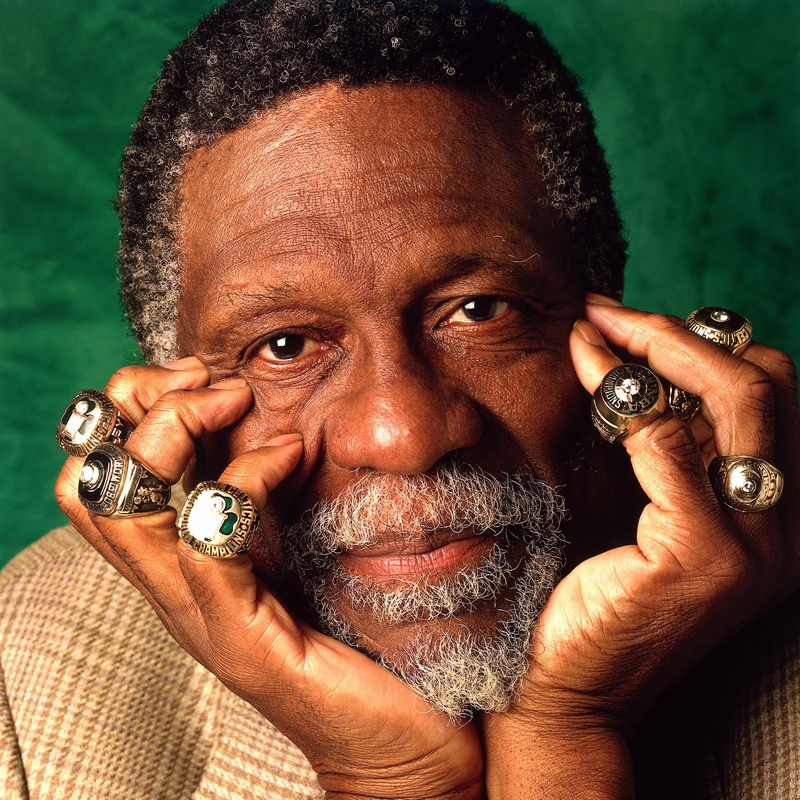 You’re telling us that this season’s Golden State Warriors, who haven’t won anything yet, are better than Bill Russell’s Celtics, who won eight titles in a row and 11 in 13 seasons? Actually, no. It would be ridiculous to say that. Last week, we released an interactive graphic, “The Complete History of the NBA,” which uses a relatively simple formula called Elo to rate NBA teams. Indeed, it currently ranks this year’s Warriors as the fourth-best team in NBA history, although they may rise or fall depending on how the rest of their playoff run goes. Meanwhile, no single season from the 1960s Celtics dynasty ranks higher than 47th on the all-time list. But Elo’s claim is that the 2014-15 Warriors season has been better than any single season in the Celtics’ run. In terms of long-term accomplishments, of course, it’s not even close. The 1960s Celtics’ competition comes, instead, from about who you’d expect: the 1990s Bulls, the current Spurs dynasty and the 1980s Lakers and Celtics. I’ve thought a lot about how to use Elo to rate sports dynasties. It’s a tricky problem, in part because you have to define when a dynasty begins and ends. Almost all of us would agree, I assume, that Michael Jordan’s Bulls were one continuous dynasty even though Jordan temporarily retired in the middle of it. But what about Kobe Bryant’s Lakers? Should the three titles they won from 2000 to 2002 be considered part of the same dynasty as the two they won in 2009 and 2010? Here’s one fairly simple approach (let us know down in the comments if you have a better method): We’ll define a dynasty as ending when a team’s Elo rating falls below 1500, which is the long-term league average. This is a reasonably forgiving standard, since teams carry over part of their rating from one season to the next. For instance, the Oklahoma City Thunder’s Elo rating never fell below 1500 this season even though they started out 3-12. By this definition, Jordan’s six titles do get grouped together. The Bulls’ rating never fell below 1527 even when Jordan was playing outfield for the Birmingham Barons. But Kobe’s five titles are not considered part of the same dynasty since the Lakers’ Elo rating was below 1500 for part of the 2004-05, 2005-06 and 2006-07 seasons. The longest streak of above-average play belongs to the San Antonio Spurs. Their Elo rating rose above 1500 on Jan. 3, 1998, and hasn’t fallen below it since, a period that covers more than 17 years, or 1,644 games1 and counting. That’s impressive even compared to the Celtics, who had an above-average Elo rating from March 14, 1956 to Nov. 12, 1969. 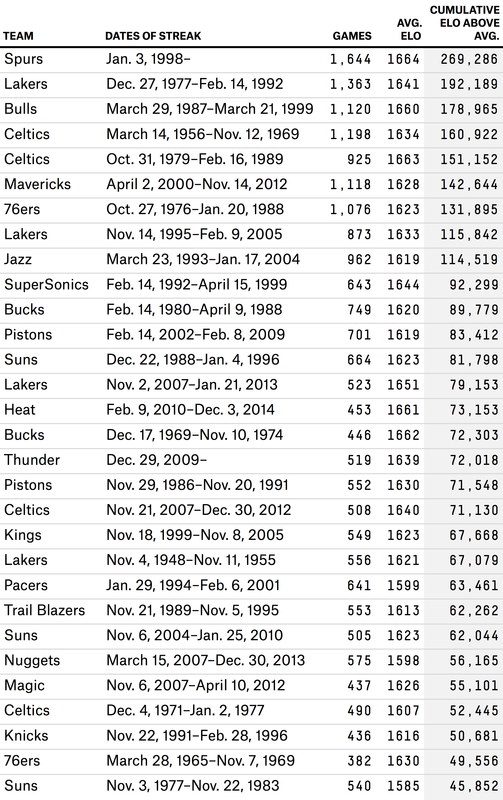 Insanely great — 13.5 years and 1,198 games — but not as great as the Spurs. The 1980s Lakers also had a longer streak (1,363 games) than the Celtics. But maybe, even if the Celtics’ streak was slightly shorter, they were playing at a slightly higher level than those other teams? Not according to Elo. The Spurs had an average Elo rating of 1664 during their streak, as compared with 1634 for the 1960s Celtics. The Lakers’ Elo rating, 1641, was also slightly higher than the Celtics’. But: the rings! How can you ignore 11 championships? You could certainly develop a dynasty-rating method that puts more emphasis on winning titles. The simple method we’re using in this article gives no special credit for them, which is why — once you get past the canonical dynasties in the top five — it likes teams like the Dallas Mavericks from 2000 to 2012, who won just one title, and the 1990s Utah Jazz, who won none. But there’s something to keep in mind when you consider the 1960s Celtics and their rings. It’s much easier to win a championship in a 10-team league, like the NBA was, on average, when they were playing, than in the 30-team league we have now. The Eastern League consists of franchises currently in the NBA’s Atlantic and Southeast divisions. The Central League consists of franchises currently in the Central and Southwest divisions. The Western League includes franchises from the Pacific and Northwest divisions. The 1980s Lakers win eight championships in a row and 10 championships in 12 years, pretty much matching the 1960s Celtics. Tim Duncan’s Spurs win 10 titles (and counting), instead of five. Larry Bird wins eight rings — including five in a row — instead of three. LeBron James wins six consecutive championships — two with the Cavaliers of the Central League and four with the Heat of the Eastern League — and is in contention for a seventh this year. The New York Knicks have a mini-dynasty, winning the Eastern League five times in eight seasons from 1993 to 2000. The Oklahoma City Thunder, rather than missing their window, win four straight Western League championships from 2011 to 2014. Karl Malone and John Stockton are three-time champions instead of perennial bridesmaids. The New Jersey Nets three-peat in the Eastern League from 2002 to 2004. Russell’s 11 rings are still impressive, but they’re no longer such an outlier when looked at in this way. Or here’s another method: Instead of assigning hypothetical championships, take away some credit for championships that were won in a smaller league. For instance, if a team won a championship in a 10-team NBA, it would get credit for one-third of a championship in a 30-team league. By that calculation, the Celtics’ 11 championships are equivalent to three or four championships in a 30-team league.3 The other dynasties aren’t affected as much. Duncan’s Spurs still pretty much get full credit for all five championships. Jordan’s Bulls get credit for five or six, and the 1980s Lakers about four. You can argue, of course, that the Celtics were so far ahead of the pack that they’d have held on to most of their championships even in a 30-team league. But they weren’t that dominant in the regular season. In Russell’s tenure with the team, they averaged the equivalent of a 58-24 regular-season record. That’s very good — but not much better than, say, Dirk Nowitzki’s Mavericks over the past 15 seasons. They weren’t even especially dominant in the playoffs! In their 11 championship seasons, Russell’s Celtics won 67 percent of their playoff games. Other NBA champions throughout history have won 73 percent of theirs. The Celtics came through in the clutch, obviously, just about every time it mattered — Russell was 10-0 for his career in Game 7s! But if you’re accused of benefiting from playing middling competition,4 the more persuasive rebuttal comes from blowing your opponents out. In the 1960s NBA, there were still remnants of a racist quota system that limited teams to three or four African-Americans. There were almost no international players in the 1960s, whereas now they make up about a quarter of league rosters. The U.S. population has increased by about 75 percent since 1960. Basketball has become a far more prominent and lucrative sport; in the mid-1960s, the NBA averaged only about 5,000 fans per game. A talented amateur athlete might have opted for another sport before basketball, and it was not uncommon for high NBA draft picks to bypass the league for another option. In other words, it seems likely that the NBA talent pool has grown at least as fast as the number of franchises since the 1960s. The 1960s didn’t even feature particularly great “fundamental” basketball. League-wide free-throw percentages were typically about 72 percent or 73 percent, compared with more like 75 percent or 76 percent now. The Celtics were the best team of their era, but also a product of it, and that era isn’t as rich for NBA competition as the one we have now. For math geeks: This is equivalent to calculating the area under the curve between a team’s Elo rating and the league-average rating. Specifically, they’re worth 3.4 championships. The Celtics’ average playoff opponent during Russell’s tenure had an Elo rating of 1570 entering the game. The Duncan-era Spurs have faced playoff opponents with an average Elo of 1639, by contrast. Consider that if you reduced the entire NBA to just two All-Star teams, East and West, each of them would win the championship about half the time. Elo’s implicit assumption is that the quality of NBA competition is fairly constant over the long run but that it can be disturbed in the short run by rapid expansion.